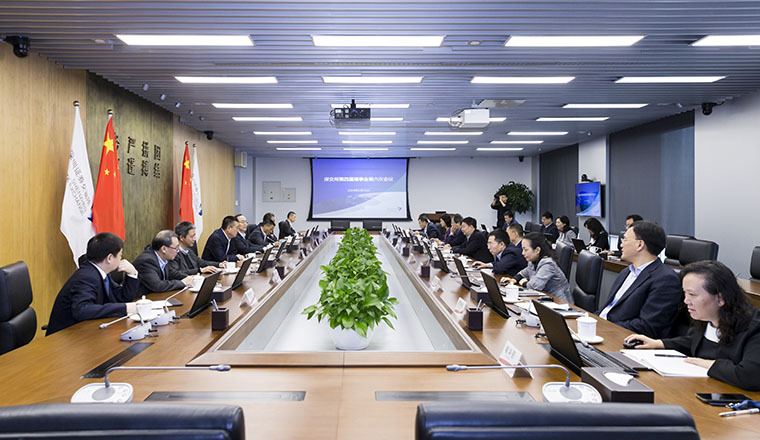 Shenzhen Stock Exchange (SZSE) held the 6th meeting of the 4th Board of Directors on the morning of January 15, 2019. At the meeting, the Board and dedicated Committees shared information about their work efforts in 2018 and passed the SZSE Work Summary 2018 and Work Arrangement 2019. Also, they were briefed on SZSE market operation of 2018 and market risks assessment of 2019 and made the next step deployment. Over the past year, the Board earnestly implemented President Xi Jinping's Thought on Socialism with Chinese Characteristics for a New Era and the spirit of the 19th CPC National Congress and firmly adhered to new development ideas and high quality standards. Following the CPC guidelines and national economic and financial deployment requirements, the Board kept overall development in mind, performed duties conscientiously and insisted on prudent progress. By enhancing decision-making, focusing on major events and motivating the members, it improved its political stance, propelled reform and innovation, strengthened member cohesion, reinforced self-construction and boosted SZSE business across the board. The meeting pointed out that the Board should implement the guidelines of the central government and the CSRC work deployments in an innovative manner and stick to its own development strategies. The Board should offer vigorous support for the management team by letting directors and members play their roles. In this way, SZSE can achieve broader functionality, more efficient front-line regulation, more targeted incubation services and better operation management, so as to continuously improve its capability to serve the real economy. The meeting recognized the achievements of the Board and dedicated Committees over the last year. They provided constructive and effective suggestions on the key business of SZSE by leveraging their expertise and market advantages from a well-informed position. Next, the dedicated Committees should continue to strengthen their consultancy function, direct members to embrace market reforms and provide greater support for the Board in the decision-making process by seeking broad consensus and offering proactive advice. SZSE still faces great challenges in risk prevention and control amid a range of internal and external uncertainties. SZSE should continue to give top priority to risk mitigation and robust operation. The Board and dedicated Committees should play their role as a linkage across the platform and unite all members to strengthen risk control and prevent major risks. Over the past year, SZSE earnestly implemented the spirit of the Central Economic Working Conference and the National Financial Work Conference and the work deployment of the CSRC. Centered on the "Three Critical Battles" deployed at the 19th CPC National Congress, SZSE made continuous efforts in tightening regulation, mitigating risks, improving weak links, and boosting growth. It has done its utmost to serve the overall economic and social development of the nation and made great headway in market construction. In the coming year, guided by President Xi Jinping's Thought on Socialism with Chinese Characteristics for a New Era, SZSE will develop still greater consciousness of the need to maintain political integrity, think in big-picture terms, follow the leadership core, and keep in alignment, foster stronger confidence in the path, theory, system, and culture of socialism with Chinese characteristics, and resolutely safeguard President Xi's core status, the authority of the CPC Central Committee and its centralized, unified leadership. SZSE will remain steadfast in its determination to further reform and opening up, grab reform and development opportunities, and intensify its efforts in all aspects to facilitate smooth execution of critical tasks like ChiNext reform and ETF option business. Meanwhile, it will serve the Guangdong-Hong Kong-Macao Greater Bay Area strategy by offering greater support to key enterprises in key areas. It will enhance risk control, improve trading mechanism, implement the delisting system and increase the quality of listed companies. It will expand two-way openness to foster closer and deeper connection between China and countries along the Belt and Road route. It will improve its ability to safeguard trade and service continuity and offer greater support to the industry and member technical system to build a best-of-class infrastructure and application platform. It will optimize its governance framework and management mechanism and vigorously promote regulatory transparency to protect the legal interests and rights of investors and market participants and foster a normal, transparent, open, dynamic and resilient capital market.